Thank you for spelling out details on Hayti and putting them in their historical context. It's hard to find this information from a source that's not on one side or the other of a Black/White or other type of fissure. Thanks for the feedback Joe - not an easy post to write, so I appreciate it. Thanks so much for your comment - I'd love to hear more about Hayti. I am gathering more pictures where I can find them - maybe you can help me with approximately where the Wonderland Theater was located? I am having trouble figuring that one out. What the government did to Hayti (and Brookstown, Dunstan, West End, etc.) is tragic. I hadn't noticed that the DD site does mention "at the corner of Ramsey and Pettigrew." Thanks! I'd love to hear your followup comments to today's N&O article from Jim Wise on Hayti. Particularly with regard to his comments on black endorsement of the freeway. Hayti was identified as a target for urban renewal in a 1957 study commissioned by the city from the University of North Carolina. Meanwhile, city authorities and downtown merchants wanted a new thoroughfare to ease traffic congestion and link the business district with Duke University and the proposed Research Triangle Park. The state highway commission decided the urban renewal area was the best place for a four-lane right-of-way. Both projects depended on voters approving bond issues in October 1962. The bond measures received enthusiastic support from the black business community and the black-owned Carolina Times newspaper, and both passed -- barely. In four primarily black precincts, 92 percent of voters supported the four renewal bonds, averaging 1,974 "yes" votes on issues that had average total margins of just 177 votes. In the same black precincts, 91.5 percent approved the freeway bond issue; citywide, the freeway carried less than 53 percent. "We're talking about two projects," recalls Wense Grabarek, a Durham City Council member from 1957-61 and mayor from 1963-71, "that came into being strictly and solely because of the black vote and the black desire to have both of these programs." 1) Progressive whites, who felt they would save people from horrible living conditions. 2) Middle-to-high income whites and Blacks, who stood to make money on the buyout of property by the government - most of them were landlords in the urban renewal areas rather than owner-occupants - and those who saw development opportunity with all the 'new' land. 3)Less important, although magnified now, an undercurrent by a group of 'traditional' whites who, at best, cared less about what happened to a Black community than a white community. The traditional story - of urban renewal being, primarily, a vehicle for Black community destruction to disrupt the newly threatening power of that community, really doesn't stand up to scrutiny. Morehead Hills/West End, Cleveland-Holloway and the outer ring of downtown - these were all 'white areas' destroyed by urban renewal. The primary racial injustice in the destruction of Hayti came from the fact that poverty and race had and have so much overlap; thus in the overlapping desires of the classists, opportunists, and idealists there was a very disparate racial impact. This is the piece missing from Jim's piece - although very good. The common perception among the poor was that what they had was going to be torn down for something better. This idea was sold by the more well-to-do, both Black and white. But the well-to-do, including those enriched by urban renewal, weren't going to invest in a dying downtown, no matter the landscape and infrastructure. They were going to invest where the money was - on the periphery. Thus the government built the only 'replacement' structures - housing projects, and belatedly, attempts to rectify the problem by investing in projects pulled together by those who stayed behind. Thus the poor were left holding the bag. One of the lovely things about advocating for preservation (and against badly designed new development) is that you can unite people of diametrically oppostite political persuasions in their common dislike for what you are doing. Folks on the Right tend to see preservationists as trying to impede their unassailable property rights (like the right to be a slumlord). Folks on the Left tend to see preservationists as callous (primarily white) elitists who want to 'gentrify' neighborhoods and displace people - impoverished people, but the tension really revolves around race. With that in mind, the News and Observer has a good article up today about controversy over the proposed Heritage Square development, and I'm wading into the miserable territory of this tension, simply because few people will have the guts to do a frank assessment. Hayti was the largest African-American business district in Durham during the segregation era, growing along the high ground of Fayetteville Street and centered on the original intersection of Pettigrew St. and Fayetteville Street. The district also centered around two prominent African-American churches: White Rock Baptist and St. Joseph's AME. Durham's most prominent and prosperous African-American citizens built their houses along the Fayetteville Street ridge, while poorer African-American residents primarily lived in the lower-lying land to the east and the west. Hayti, 1959. The combination of general inner city disinvestment and the end of legal segregation took their toll on the economics of Hayti as a segregated business district. 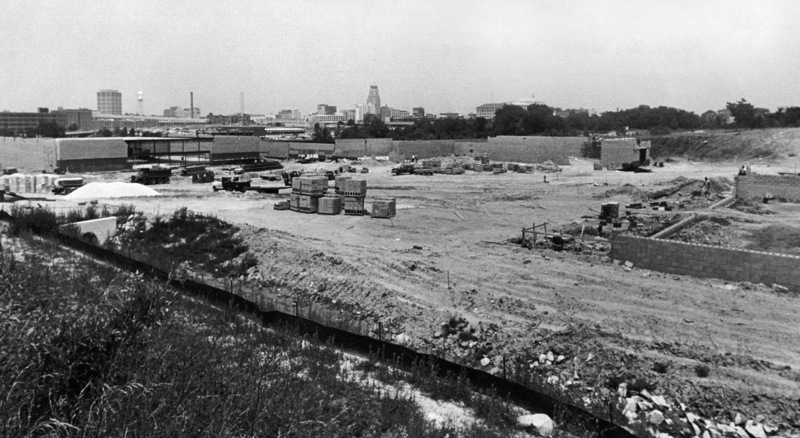 Then the city (with Federal money) took a huge sledgehammer to that which remained - putting the Durham Freeway through the heart of the business district, but, more importantly, using Federal urban renewal money to destroy a vast swath of structures from Pettigrew St. to Lakewood Avenue. Fayetteville Street was re-routed and turned into a vastly over-capacitized swath of asphalt. Some businesses and churches used their buyout money to move elsewhere in the community, such as Scarborough Funeral Home and White Rock Baptist. Many businesses simply folded. While the leaders of Durham did many, many stupid things in the 1960s in their attempts to 'modernize' downtown and 'clear substandard housing', this was the stupidest. The fact that much of the housing demolished was populated by African-Americans seemed lost on some, and was a good reason not to give a damn what happened to the people who lived in that housing for most. Trying to look through the lens of that time, while there were certainly those who were purely out to do "Urban Removal", there were some people did have good intentions in making a bad mistake. The housing that the poor had access to was miserable - much worse than most of what is out there now from a sanitarian standpoint. The clean, new housing projects were seen as a boon, and, if the quotes are to be believed, welcomed by many residents when they first moved in. Few people, except maybe Jane Jacobs, understood how badly experimenting on the poor with fad-ish modernist design would turn out, and how unethical and bigoted the top-down, non-inclusive planning of the 1960s was. 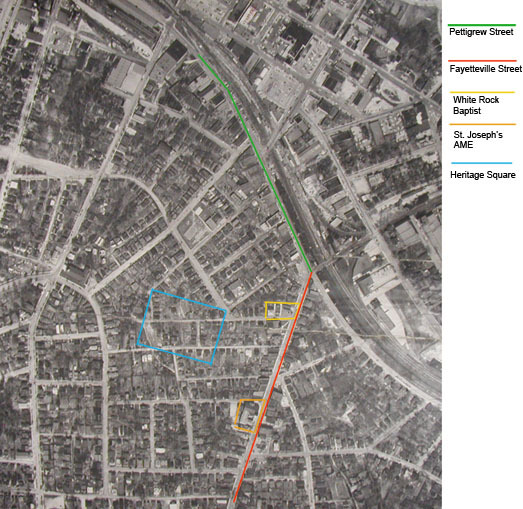 I'm not sure when the first attempts to resurrect the economics of the Hayti business district began, but a series of projects partially or completely funded by the city have, for many years now, attempted to incubate African-American owned businesses along the Fayetteville St. corridor. Heritage Square was one of those attempts. I'm going to quote an earlier News and Observer article here, from 02/09/06, which summarizes the background of the development well. "Heritage Square was built about 20 years ago...The shopping center was financed with money from private real-estate companies, city loans, 23 individual investors and a coalition of black churches and community groups. The project ran into financial problems almost from the start, and by 1990 the taxpayer-backed loans were delinquent. Rather than foreclose on the property, the City Council chose to subsidize the center by moving the offices of Durham's Housing and Community Development Department into a vacant storefront and pay rent well above the market rate. Despite the city's inflated rent payments, however, Heritage Square has fallen into disrepair due to a lack of routine maintenance and repairs." I don't know the exact build date, but I'd guess that it dates from earlier than 1986. Suburban-style developments can be deceiving though, because they typically lack any distinct architectural character, and those in disrepair can appear older than they are. Andy Rothschild, who owns Scientific Properties (which developed the Triangle Biotechnolgy Center on Foster St. and is redeveloping the Venable Warehouse on Pettigrew St.) has a contract to buy Heritage Square from its current owners, Heritage Square Associates, who asked city of Durham to, according to the N&O, "write off at least half of the $646,029 remaining on two taxpayer-financed loans so the company could sell the property at a profit. That proposal got a negative reception from city officials, but it appears the deal will likely move ahead without the city forgiving the debt." Andy proposes to build a significant mixed-use development; from what I know of his past projects and the info that has been published about his plans for the project, he plans to use good, evidence-based design principles to build the kind of project that, from a land-use perspective, promotes a walkable live-work community. From a development standpoint, it is a risky proposition. Most developers would not have the guts to develop in a spot where so much business has failed, pretty far from the burgeoning core. 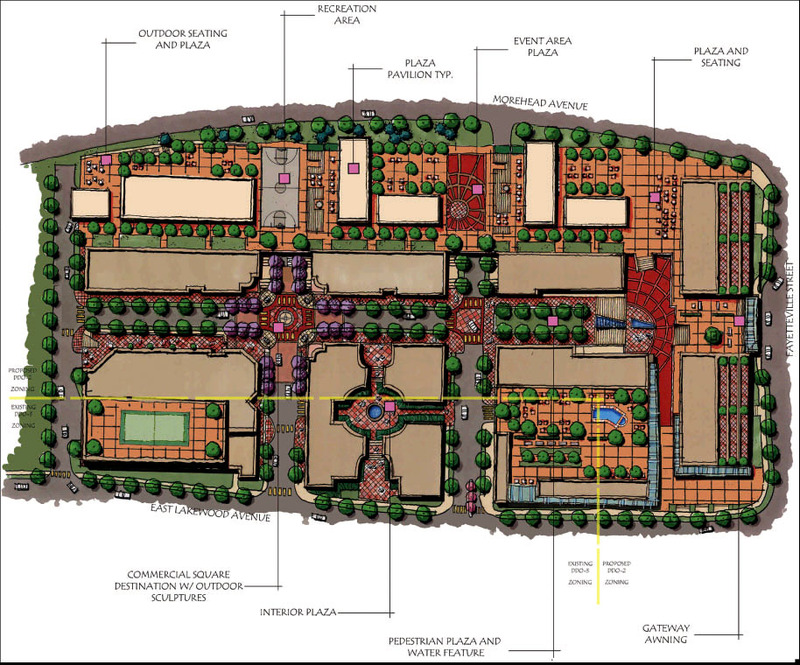 While there are issues with this site plan, particularly in how it develops the inward streetscape over the Lakewood/Fayetteville streetscape, it is a giant improvement over what is there now. There is, however, a big problem. His proposal was delayed by the City Planning Commission, purportedly over concerns about traffic counts. This is, of course, not based on the evidence, given the massive size of the 1960s road infrastructure on Lakewood and Fayetteville around the shopping center. While I have applauded Larry Hester's fight to call some city attention to improving the inner neighborhoods (specifically Fayetteville St. in his case), he has come out strong against Andy's proposal. And therin lies the subtext for the opposition; those that have received city funding in the past to build their projects (such as Larry's Phoenix Square) don't want competition. Wrapping protectionism up in racial politics is a potent mixture. Thus the development proposal has been cast as Black vs. White in a recapitulation of the Hayti saga. The rhetoric is hyperbolic - one planning commission member, Corinne Mabry, said she was "not going to sell her people down the river." Today's N&O article contains quotes from people ranging from utter opposition to proposing inclusion of a wall "like the Vietnam memorial", etched with the names of businesses from old Hayti. Calls for 'preservation' of Hayti have been aired. 1) Hayti, the walkable business district at the heart of a tight residential community, is gone. The only two community structures left from that era are St. Joseph's AME (now part of the Hayti Heritage Center) and the Stanford Warren Library. The Hertiage Square Shopping center is an economically failed development, built for car access rather than pedestrian access. It isn't even on the site of the old business district, but is located in the lower ground to the west of the original Fayetteville St. Only two businesses in Heritage Square are still owned by African-Americans (one of whom is quoted in the N&O as favoring the development). Should Hayti have a historical marker - absolutely. But I'm not a fan of putting it in the wrong place. 2) This location is no picnic. Not only is it where many businesses have gone to die - crime continues to be a problem (I noticed the cashier at Food World had a huge bruise on her face a few weeks ago. She told me that they were routinely robbed; people simply walked out with merchandise without paying. She had tried to stop one of them and he had slugged her.) Let's not romanticize this suburban-style shopping center as a place where children frolic and everyone knows your name. 3) While I understand that distrust would ride very high, this is a real estate development. Andy has expressed interest in the current tenants leasing space in the new development. There is the potential for more African-American businesses to be present in the community, because savvy businesspeople will recognize the architectural improvement over the decrepit Heritage Square. Unless you own a competing shopping center that you think can't compete from a design perspective, more business and services are good for the community. The greater concentration of businesses, the more likely complementary businesses are to open nearby, in order to take advantage of the market concentration. This would help the nearby businesses. 4) This concentration comes hand-in-hand with density. Density is a point on which reasonable people can disagree, and alarmist images are typically promulgated by developers when the term arises. It isn't clear why it is a concern in this case, other than as a general reaction. 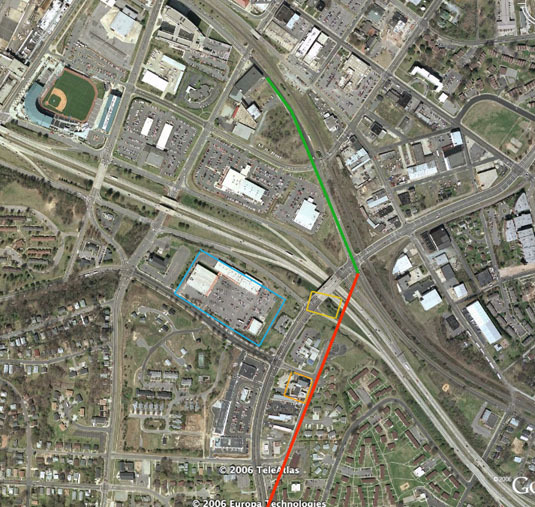 The roadways are designed to handle far more traffic than this development can generate. The fact is that the Hayti area is very low-density right now - much lower than it was historically. 5) The owners of this shopping center can't be doing well financially from this property. To the extent that the original group of investors is still involved, this is an opportunity to unhook a financial albatross and reinvest their money elsewhere in the community. 6) Those who are protesting this development, and calling for the 'preservation' of Hayti are missing, intentionally or otherwise, the ongoing destruction of still-extant African-American history. Most recently, the Royal Ice Cream parlor demolition by Union Missionary Baptist, the city's demolition of the Woolworth building 3 years ago, and 4 years ago, North Carolina Central's demoliton of multiple blocks of historic African-American housing for new dormitories. Only through the efforts of the Historic Preservation Society of Durham was one structure, the Stanford Warren House, saved by moving it to a new location. Where was/is the outcry from these same community members over these destructions of African-American history? Could it have anything to do with who is perpetrating the destruction? I hope that the reasoned voices of the community - who recognize that the current development isn't helping anyone (except perhaps Phoenix Square) and want to see a better use of this space using design priniciples that, in street scale and walkability, actually resemble the physical form of the old Hayti much more than Hertiage Square does - come to the fore.